Many of us find it tough to stick to a regular workout routine, which could simply be because we get bored. It’s hard to get pumped up about running on a treadmill for 30 minutes every single day. With high intensity interval training at our West Loop gym, however, the workouts are always different. The variety of exercises not only prevents you from getting bored with your fitness routine, they boost the effectiveness of your workouts. HIIT keeps your body guessing, helping you to get stronger after each and every day in the gym. What it is: Tabata training is a HIIT workout lasting only four minutes. The idea is that you complete repetitions of an exercise for 20 seconds, pushing yourself as hard as you can during those 20 seconds, then resting for 10 seconds. After those (very short) 10 seconds are up, you go back to that intense 20 second period of exercise. You continue doing this for eight rounds. History of tabata: You can thank Japanese scientist Dr. Izumi Tabata for discovering this form of exercise. Dr. Tabata and a group of researchers tested two groups of athletes: One group took part in moderate one-hour workouts, five days a week for six weeks. The second group opted for high intensity workouts that lasted only four minutes and 20 seconds, four days a week for six weeks. Amazingly, it was the high intensity interval training group who experienced better results. They saw a higher increase in their aerobic rate when compared to the moderate exercise participants, and improved their anaerobic system by 28 percent. Example of a tabata workout: Tabata training can incorporate any exercise you like. Do as many pushups as you can for 20 seconds, rest for 10 seconds, then do it all over again until you’ve completed those eight rounds of pushups. Want to get your core ready for summer? Try doing eight rounds of crunches. If you’d like to up your cardio, do burpees (everyone’s favorite) for 20 seconds. 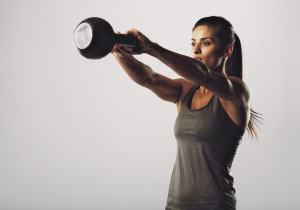 If you’d like to watch an example of tabata, see Crosstown’s Fitness Director Betina Gozo doing a tabata workout with the folks at Windy City Live here! What it is: AMRAP stands for “As many rounds as possible.” Your goal is to get in as many rounds of a particular exercise during a specific time period as you can. AMRAP workouts can differ in length, lasting anywhere from 10 to 40 minutes. This type of workout is a great way to track your fitness progress. At the beginning of an AMRAP regimen, you may only be able to get in three rounds of 25 sit-ups in 10 minutes, for example. But after a few weeks, that number might increase to four or five rounds as you get stronger. Something to keep in mind during an AMRAP is your form. It’s much better to get in 10 repetitions with good form, rather than 20 reps with poor form. You’re going to see more effective results when you concentrate on doing the exercise right. Example of an AMRAP workout: Start the clock for 30 minutes and see how many rounds of the following exercises that you can finish. If you’re looking for a Chicago gym that focuses on high intensity circuit training, we’re happy to help you out and answer any questions you might have!